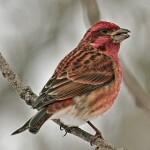 High “pwee-de-lip.” Song is series of warbles, flutier and more varied than Purple Finch. 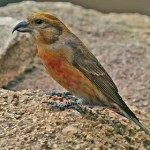 Description: Strongly notched dark tail, with distinctly streaked undertail coverts. 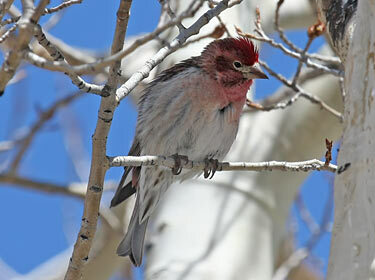 Adult male has crimson-colored cap that ends sharply at brown-streaked nape; brown upperparts with dark streaking on back; pale rose red on face, throat, and breast. Broad brown eyebrow; brown streaking on sides; and whitish unstreaked belly. Females and immatures are brown overall with heavy dark streaking below; lacks strong white markings on face. Behavior: Forages on the ground for seeds. Habitat: Associated with open coniferous forests during the winter. Where in Nebraska: Rare spring and fall migrant and winter visitor in the Panhandle. Also reported in Logan, Boone, Adams, and Webster Counties. Field Notes: There is no competition between the closely related Cassin’s, House, and Purple Finches because they are each found in different altitudes and habitats. 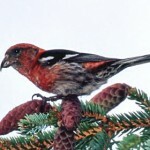 Fun Facts: Cassin’s Finches are often seen visiting mineral deposits on the ground because they crave salt.